I’m getting deep in here today. I’m going into the psychology behind my characters. Not the psychology of my characters, but… you’ll see. The idea came about as I was trying to figure out how in the world to get in the head of the protagonist for a potential new series. I was wondering where characters came from, how they were born, whether a character was somehow a reflection of an author themselves, etc. This protagonist, she’s not a good person necessarily, and she’s not a bad person, either. But the bad she does? Is very, very bad. I suppose it’s a question writers, at least some of us, have been asking for eons. “Am I separate from my characters?” I suppose I have firm ideas on the subject, but I was curious to know if my writerly friends felt the same way I do. So I reached out to them and asked for their participation here. This is the list of questions I came up with. Where in the world did you come from, Character XYZ? How do your characters take shape? That’s where I started. I didn’t know what to expect, though I had an idea. Interestingly enough, the ideas I had didn’t mesh quite the way I expected them to with the answers I received. I’ll let you see what my friends said and you can tell me what you think. Maybe, a little bit. I mean, some characters embody some of my characteristics in one way or another, but it’s usually an exaggeration of those characteristics. I think it goes back to the old adage that says “you write what you know.” But most of us view ourselves as rather ordinary, (or at least I do), and readers don’t want to read about the ordinary. They get enough of that in their day-to-day lives. So yes, my characters are an extension of me. But I take that extension of myself, and sculpt it for the purposes of making the story as interesting to the reader as I can manage. A writer has to decide how the character could best serve the story. How can he or she move the story along in a way that holds the reader’s interest? Much of my characters’ personality is determined on the fly, and is decided by what I feel will best allow the reader to relate to them, and so bring them (the reader) along on the ride that I’m trying to get down on the digital page. Much of this is done by trying to think of clever ways that we would react if we were them (going back to the first question). But that year, we had the first ice storm in decades, and in the Brackett household, our pipes froze. Despite letting our faucets trickle, we had been without water since that morning. So we decided to go out to dinner at a nearby restaurant. Just as we were about to walk out the door, there was a sudden pop, and the sound of rushing water… from the ceiling. Yep, the water line in the ceiling above the kitchen had chosen that moment, just as we were walking out the door, to burst. For a writer, that’s a prime example of a “what if” moment. What if it had burst five minutes later, and we weren’t going to dinner, but were leaving on a week-long trip? That could be part of a comedy story. What if it had burst over our bed? When we were trying to stay warm from the ice storm? An ice storm that had been so severe that the power lines had snapped from ice buildup, and so we had been out of power for a week? That could have given someone pneumonia, and been the beginning of a romance story… of a tragedy… or even an apocalyptic, ice-age creeping across the globe, sci-fi thriller. Those “what if” moments can set the plot in your tale. And then the writer gets to decide “what would I do in those circumstances?” If I was a muscular, military trained, intelligence operative at home on leave, when the super-dooper ice bomb is detonated, sending the world into chaos, how would I react? Yes, we writers have crazy imaginations. It’s a pre-requisite for the craft. We set our characters in terrible situations. We relate to them, putting ourselves in their shoes. And we determine their fates, based entirely on our imaginations. Not really. I like to approach writing as a craft, and that makes me a craftsman. As such, it’s my job to bend the characters to my will (as much as possible). That’s not to say they don’t often take on a life of their own for a brief time. I’ve often had characters that were planned as little more than cannon fodder, who have served a much greater purpose, and ended up as major characters. I’m too old to claim to be a child of the electronic age. But when it finally came around, I embraced it fully. As such, I keep my stories in electronic form, stored on my computer. I have several files associated with each story I write… note files, deleted scenes files, and yes, character files. In addition, I keep backup copies on external hard drives, as well as in the cloud. I learned my lesson many years ago, when lightning struck a tree in our front yard. The resulting electrical surge fried the computer I was working on, and I lost half of a novel I was working on at the time. Ever since then, I make it a point to keep multiple backups. And there are times when I’m supposed to be working on one story, and a plotting problem, or a character issue from another one will jump into my head from another book, screaming for attention. It can get tricky. I recently wrote a character in my upcoming novel, Chucklers, who is such a foul mouthed, misogynistic, self-centered, and flat-out crazy SOB, that I often commented that I felt like I needed a shower after spending time in his head. But his character served a purpose for the story, and to do it justice, I had to accept the character as he was, rather than how I wanted him to be. Not everyone we encounter in life is going to treat people the way we think they should be treated. And if we want our stories to have the touch of realism that will allow the reader to get lost in the tale, we have to populate them with all sorts of characters as well, whether we like them or not. For me, this one is easy. I don’t outline much. I’m more of a “pantser” (a term for those of us who write by the seat of our pants.) When I begin writing a story, I usually have a beginning, a main premise, and some key scenes in my mind. I often have an ending in mind, as well, but I’ve learned that by the time I get to the final scenes, most of the story has changed so much that what I thought was going to be the end has completely changed. And the reason it changes is because I ALWAYS trust my characters to help me shape the story as it unfolds. The best writing, for me anyway, comes when a character completely goes off the rails and insists that I’ve got it wrong. They aren’t really the antagonist that I thought they were, but rather another protagonist who’s been framed, or is such an unlikeable person that everyone simply assumes they’re a bad person, but they’ve simply had such a rough life that they simply don’t react to others the way that most people would. Those are the time I absolutely love, as a writer. Another tricky one. I know that everyone and their brother says that the best stories are always character driven, and that you should always strive to have your characters frame your story. But I like to think that the two go hand in hand. My stories are framed by both, character and plot. My characters, if put in bland, ordinary circumstances, may be interesting in and of themselves. (Or they may not, depending on who you ask.) And my plots might be intriguing on their own, or not. But when you have interesting characters, placed in unusual circumstances? That’s when you get a great story. To get the proper mix, I try to put the right characters in the right situations. It’s a tightrope, and only the readers’ reactions will tell you whether or not you’ve succeeded. Jeff Brackett is the author of the post-apocalyptic novel, “Half Past Midnight“, and its companion novella “The Road to Rejas“, as well as the science fiction crime thriller “Streets of Payne“. 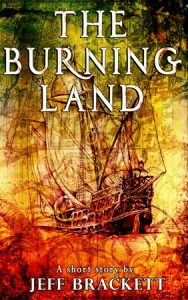 His latest release, “The Burning Land,” a short story, is available now. He also has a variety of other short stories and novellas published in magazines and anthologies, and has recently signed contracts with Severed Press for two separate book series… the apocalyptic horror “Chucklers” saga, and the “End Point Pangaea” science fiction adventure series. Book 1 of the Chucklers series (Laughter is Contagious), is with the publisher at the time of this writing, and should be available to the public soon. You can follow Jeff’s blog at https://jlbrackett.com and sign up for notification of his latest publications here. If you’d like to read more about him, here is a link to his Amazon author page, and you can find him on Facebook here.